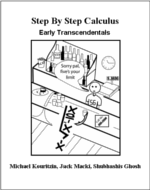 Ideal for all students before taking their first calculus course. Ideal for students willing to gain an edge in their first calculus course. Ideal for students willing to gain an edge in their second calculus course. Who should use "Step-By-Step Calculus"? If you are in high school and plan to enroll in university engineering, science, or business, MuchLearning's "Step-By-Step Calculus" will prepare you for first-year calculus. If you are in taking a first- or second-year calculus course, this MuchLearning book will give you the edge you need to succeed. What should students know first? MuchLearning's "Step-By-Step Calculus" is geared to overlap with high school, much like any well-taught first- and second-year university course. Therefore, to take full advantage of "Step-By-Step Calculus", you should be most of the way through high school or already enrolled in university.